We accept PayPal, Visa, MasterCard, Discover and American Express, checks* or money orders. Just click the "Add" or "Add To Cart" button next to a product of your choice. Once you have chosen all of the items you wish to purchase, just click the "Checkout" button at the bottom of any page in our site or when viewing your cart's contents. You will be prompted by the cart program for your preferred payment option. 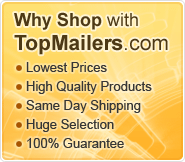 Make checks or money orders payable to TopMailers. All personal checks may be held for 10 days prior to shipping item(s). *please note that orders are not shipped on holidays, weekends or days off for national holidays. If shipping time is a concern around a holiday, please contact us for more information prior to ordering. Once we ship your item, you will receive an automated email telling you how to track your package and find the expected delivery date. Shipping and handling is calculated through the shopping cart based on the items you have selected and your location. Unless otherwise noted, all items are shipped via standard ground service. You can check this cost prior to checking out by entering your zip code in the "Calculate Shipping" box and clicking on GO. This must be checked again any time the cart contents changes or quantities are changed. When checking out, the shipping costs will be automatically calculated there as well. Yes. Our shopping cart will automatically calculate shipping discounts for you when available! If looking for pallet quantities of an item or items, contact us directly for possible freight shipping options which could save you quite a bit on shipping costs. How do I contact TopMailers? Please visit our contact page to view emails, telephone numbers and standard address information for TopMailers. No, not without express written permission or a signed agreement. All information and images contained within this website and used on eBay or Amazon or used in other venues are copyrighted materials. All copyrighted materials used without our written consent will be prosecuted to the full extent of the law.